Constanza Chorus is a City of London based choral society which was started in 2010. The choir is large – around 130 members – and is a very friendly and sociable group. The choir is led by charismatic conductor Joanna Tomlinson. Constanza Chorus performs three concerts a year in London churches or concert halls such as Cadogan Hall. In addition, the choir takes part in projects such as recording, workshops and tours. In June 2015 eighty choir members went to sing in Rome including a memorable performance at St. Peter’s Basilica in the Vatican. The choir will be going to Germany in June 2018 for their second tour singing at Brandenburg Cathedral and for the morning service in Bach’s church, Thomaskirche in Leipzig. March 2016 the newly formed Constanza Chamber Choir performed their first concert with a programme of Lent and Easter music. Since then the Chamber Choir have given a number of concerts. They will be singing Byrd Mass for Four Voices and Vaughan Williams Mass in G Minor at a concert on 8th November 2018. 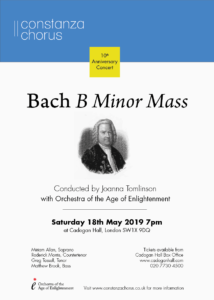 Saturday 18th May at 7 pm (Please note the time) To celebrate their 10 year anniversary Constanza Chorus will be performing Bach B Minor Mass with the Orchestra of the Age of Enlightenment and soloists Miriam Allan, Roderick Morris, Greg Tassell and Matthew Brook. Tickets are on sale now from Cadogan Hall. Tickets are now on sale for the Constanza Chorus tenth anniversary concert at Cadogan Hall on Saturday 18th May 2019 at 7pm. The choir will be joined by the Orchestra of the Age of Enlightenment and soloists Miriam Allan, Roderick Morris, Greg Tassell and Matthew Brook in a performance of Bach B Minor Mass. To book your tickets go to the Cadogan Hall website – www.cadoganhall.com or call the Box Office: 020 7730 4500.